Home / GOVERNMENT/POLITICS / Opinion/Editorial / OPINION: The electoral romance between the Church and Politics in Nigeria. Is it appropriate? OPINION: The electoral romance between the Church and Politics in Nigeria. Is it appropriate? The recent trend of politicians using the church pulpit as a medium to directly or indirectly campaign for votes in Nigeria is so despicable and totally unacceptable. Its election time, now politicians are busy attaching themselves to church leaders with the biggest congregations. Consciously or unconsciously, our church leaders are being lured into politics. They get enticed with affluence and power. It takes much courage to resist the advances of some influential politicians especially in this era where the vision of Christianity which is to proclaim the word of God, touching the lives of unbelievers and winning their souls for Christ in Nigeria has changed to teachings about prosperity and power. Taking a deep look at the major churches where some certain politicians have campaigned will reveal some sort of division among their members. 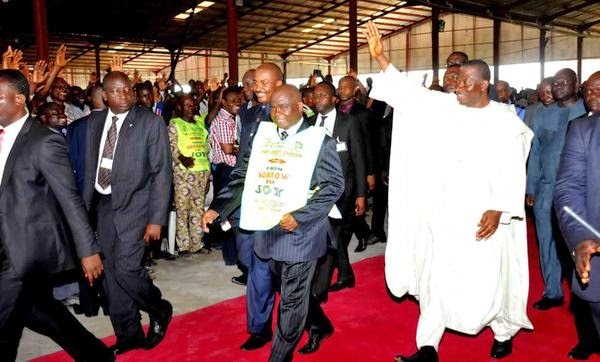 Someone gave an account of how two major men of God at a church event spoke simultaneously in support of two competing politicians in Nigeria namely President Goodluck Jonathan and Retired Major-General Muhammadu Buhari. Personally I feel this is a very absurd situation. The church shouldn’t be friends of politicians; neither should the church be enemies of politicians. Simply the church should stay indifferent. The church should serve as the conscience of the state. This will give the church a good vantage position to appeal to the conscience of erring leaders or followers in the advent of confusion and instability. This can be likened to a football game, in the course of a heated football match, the spectators and coaches always seem to have better ideas of what the decisions of the players on field should be. They see the loopholes and strengths of the game better than the players not because they are better footballers but because of the position they are occupying. Bringing the best football analyst, coach or commentator to the pitch to kick the ball may be a disastrous move but yet their views are golden when they are outside. This to me should be the position of the church. Whether we want to believe it or not, major churches in Nigeria have taken sides on their choice of candidate. The outcome of the result will strengthen the faith of others and cause some others to fall out of faith. It might even prompt some men of God to lose relevance in the society as we have already experienced. The romance isn’t profitable to the course of Christianity in any way; it spells a future doom for the society. The issue of 7 billion naira members of the All Progressive Congress (APC) accused the leadership of the People’s Democratic Party (PDP) is a case in hand. I don’t know the validity of the claim but it doesn’t add to the good reputation of the church as a clean and holy land of God built around truth. There is never a smoke without fire and in Nigeria today, we all believe there is an element of truth in every rumour. Furthermore, there was a time in the UK when the church and state were one. What happened? It led to the Dark Ages of the church. The church became corrupt; politicians messed up everything. Cathedrals started closing down and people stayed away from worship centres. Men of God have a higher calling than politics; they should be aiming at their treasures in heaven and ignoring the materialistic distractions on earth. I am a masters degree holder in the field of Political science, in one of my classes. A renowned lecturer at the University of Ibadan, Dr. Dikiru Yagboyaju emphasized that majority of the electorates in Nigeria vote wrongly. According to him, voting should be done on the basis of the general will of the society and not on the basis of personal attachment to the aspirant in the form of family ties, tribalism, working relationship, sexual orientation, economic or political interests, religion, educational background or others. You should cast your vote for that aspirant you feel shows utmost capability of serving the people which is the implication of being a leader. This is against the context in Nigeria where politicians are using the church leaders as a medium to get to their followers. That is an abuse of loyalty, now we have Christians clamouring to vote for Christians and Muslims advocating to vote for Muslims as if religion makes good leadership. This brings disunity and a house divided against itself shall fall. Making a quick reference to the advent of a state using the Social contract theory by Thomas Hobbes will be essential. Before the advent of a state, the society was chaotic; man in a state of nature was selfish and brutish. He had an uncontrolled desire to amass wealth. The concept of might being right was prominent. In order to curtail this state of instability which could have driven the state into extinction, the people submitted their rights to a mandated set of people known as the leviathans to see to the administration and rulership over their affairs. The leviathans/ leaders stood out to represent the interests of the people, serve them and exist for the general will of the people towards the betterment of the state. The intellectual lesson from this is that voting shouldn’t be done on the basis of religious ties or affiliation, no religious leader should influence/ or endorse a candidate for his followers. It’s a way of denying them the freewill of exercising their political rights which is against the law. It’s normal for them to have their own preference as regards the aspirants, but this should be kept private, that’s the essence of a secret ballot system which we practice in Nigeria. A controversial issue like politics should be handled with care before it becomes a Trojan that eats up the church foundation. Religion and politics are two different concepts. The general will of the society unifies and supersedes everything. Let us put sentiments aside and vote for that leader that will take Nigeria to the summit. This is our country; let’s team up to change the course of history. Every other country in the world can only be termed as a house, Nigeria is our home.